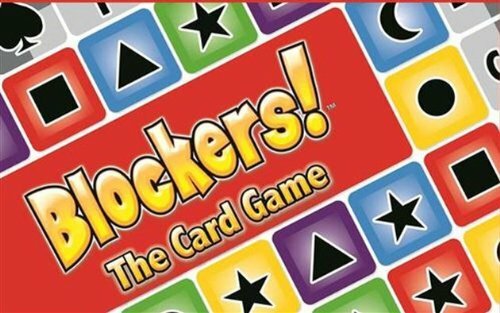 ...take a minute to learn the card version of Blockers!Get Ready:Define the game playing area with the 20 Frame Cards-Numbers on top and bottom and Letters on the side creating a 4 x 4 playing card area and then deal 16 Victory Cards onto the grid.Strategize! Play a Hand Card face-up on the table in front of you and then take a Victory Card from the matching row column or region on the "Board". Place the Victory Card on top of a single stack in front of you. Every additional Victory Card you take this round must match either the color or the shape displayed by the card on the top of your stack. Be clever you only get one of each type of Hand Card plus one "Kicker" (wild card). You will play as many rounds as there are players.Block! Block your opponents and foil their plans by anticipating and taking the Victory Cards they will want based on the top card in their stack.Win! Collect the most Victory Cards to win!